Las Vegas — The 2017 AEC Excellence Awards winners were revealed Nov. 14 at Autodesk University 2017 in Las Vegas. The 2017 AEC Excellence Awards competition recognizes global projects that embrace connected BIM technologies and sustainable design in the AEC industry. This year’s competition received 145 submissions representing more than 30 countries, indicating that around the world, innovation in building design and construction is thriving. 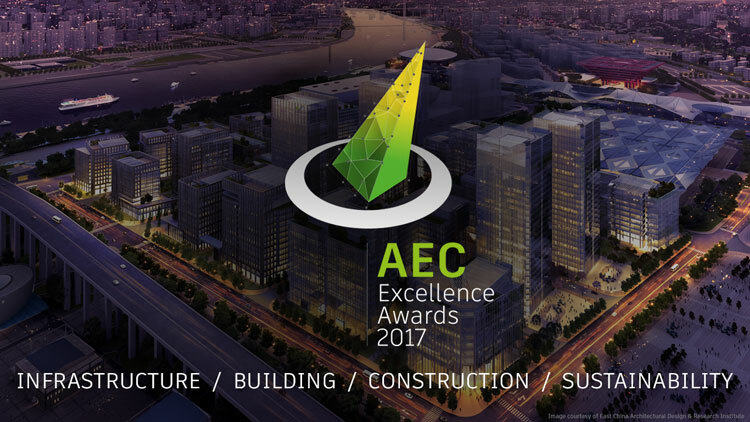 The 2017 AEC Excellence Awards were co-sponsored this year by Autodesk, HP, Construction Dive and Smart Cities Dive. The independent panel of judges selected the winning projects in the categories of Sustainability, Infrastructure, Building, and Construction. First Place award: Geotectura, Axelrod-Grobman Architects, NCA, Assa Aharoni Consulting Engineers for The Porter School of Environmental Studies. The Porter School of Environmental Studies at Tel Aviv University truly embodies what is taught and researched both within and outside of its walls. The 4,000-square-meter building is the first of its kind in Israel, achieving both LEED Platinum certification (92 points) and 5 stars in the Israeli Green Code 5281. Jie Fang Nan Lu Community Culture and Sports Center is dedicated to public welfare — both physically and culturally. It is designed for maximum sustainability and to operate as a net-zero building, obtaining both LEED Platinum and China’s Three Star certifications. Magnolia Quality Development Corporation Ltd.’s mission is to transform an urban, 17-acre plot into a sustainable, smart city model with a fully integrated, digital, mixed-use development with both commercial space and residential towers. By minimizing environmental impacts, saving energy, and reducing carbon emissions, the $1 billion project is designed to improve quality of life and boost sustainable development for the community. At 470,000 square meters, NAICM will be one of the world’s largest airports. Its flowing form is inspired by flight., but its primary design focus is the passenger experience. The terminal itself is almost 1.5 kilometers long and a single, continuous grid shell with an innovative roof and fixed boarding bridges in one enclosure. Taking place underneath the bustling streets of Manhattan is one of the largest infrastructure projects in the United States. The Metropolitan Transportation Authority’s East Side Access will connect trains from Long Island and Queens to the east side of Manhattan. This includes an eight city-block-long concourse and multiple train platforms 150 feet beneath Grand Central Station as well as major renovations of Harold Interlocking, the busiest railway junction in the country. The Arna-Bergen, Ulriken Tunnel is the first use of a tunnel boring machine in Norway. When the new parallel tunnel is finished, double tracks will run between Arna and Bergen, providing more frequent departures between the cities and updated stations to accommodate the new trains. While the interior of many museums look at the past, the Museum of the Future will be everything its name embodies: exhibitions of innovation and incubation of new ideas. Located adjacent to Emirates Towers in Dubai, the $136 million, 30,000-square-meter iconic building will have an instantly recognizable distorted torus shape, epitomized by its futuristic stainless-steel façade with illuminated glazed Arabic calligraphy. The Hohhot City Saihan District National Fitness Center Project in Inner Mongolia is being designed and constructed to encourage participation in China’s 2016-2020 National Fitness Plan. With a site consisting of 91,437 square meters and a total construction area of 33,000 square meters, the building is divided into two zones that include multi-functional gymnasium with 5,000 seats for sports events and fitness facilities. Between its opening day on October 20, 2020 and its close on April 10, 2021, the $6.8 billion Expo 2020 Dubai will bring together 180 countries, each with its own pavilion, and the capacity to welcome up to 270,000 visitors per day. The enclosed area of the expo will occupy 2 million square meters with the remaining 2.4 million square meters for amenities and facilities. Image courtesy of China Construction Eighth Engineering Division Co., Ltd.
Expected for completion in the fall of 2019, Tianjin Chow Tai Fook Financial Center will be a striking new landmark with integrated business and commercial space; luxury apartments; and a five-star hotel. It has a 390,000-square-meter total construction area, constituting a four-story basement, a five-story podium, and a 103-story tower, reaching a total height of 530 meters. Set to become the tallest structure in the city of Beijing, and in an area prone to 8.0 seismic intensity, CITIC Group’s new $3.5 billion China Zun Tower — with a gross floor area of 43.7 million square meters — will reach 528 meters with 108 floors and seven floors underground. Surrounded by the sea, Japan is especially susceptible to the devastation of tsunamis. Since many areas are connected by a single road, there is a high risk of isolation during a disaster. A new highway was recently built to serve for additional transportation, which included the construction of the 2,380-meter Mikusa tunnel. Learn more about the winners of the 2017 AEC Excellence Awards and watch the 2017 AEC Excellence Awards Showreel at https://www.autodesk.com/solutions/bim/hub/aec-excellence-2017.